The ruins of Hampi can make your imagination run riot. In these surroundings there was a cultural efflorescence, when musicians, artists, and artisans gathered to create poetry and fulfill the grand vision of their kings, says MAYA JAYAPAL. The banks of the Tungabhadra river in Bellary district, Karnataka are strewn with massive boulders, scattered like the playthings of giants. These granite boulders, estimated to be millions of years old, were used to construct the magnificent city of Hampi, capital of the Vijayanagar a empire which held sway in the Deccan for 250 years from 1336 A.D. to 1565 A.D., when at the Battle of Talikota, four Muslim kingdoms ingloriously routed its armies. The rulers the river to form aqueducts, drains and tanks used. Their ruins remain at Hampi, evidence of the might and sagacity of the city's rulers. One spectacular excavation is the stepped tank, about three metres deep, into which water was fed by a series of stone channels. The steps are effectively arranged, in small pyramids, each block of stone bearing an inscription in Kannada detailing its exact location in the scheme of construction. The opulent palaces, the magnificent temples and the massive fortifications appear very natural among the rock formations, as if they have just grown out of these theatrical, barren, craggy surroundings. A foreigner said of the stones: ``they are piled one block on another in a manner most singular, that it seems as if they stood in the air, not connected with each other''. The stones have been used for many purposes, some of the slabs are shaped like banana leaves with depressions for food, a stone trough with a hold for drainage, probably for horses and elephants to drink water from. My favourite is the Hazara Rama temple, an exquisite structure for private worship of the Vijayanagar kings. Standing within a walled enclosure, it exudes an air of elegant serenity either when the moonlight softly washes over the friezes, or when it glows in the sunlight. The herds and bands of elephants, horses, dancing girls and musicians, and scenes from the Ramayana come alive on the outer walls of the temple. The eye lingers on the fine features of a musician, or the graceful limbs of a dancing girl or the noble prancing of a caparisoned steed. Inside, the four black polished pillars invite you to run your fingers over their smoothness. Their geometrical square blocks alternate with cylindrical shafts, all luxuriantly carved in tangible loveliness. The large stone chariot in the Vithala temple is a marvellous testimony to the skill of the stone carvers - its wheels can rotate on the axle. The carved pillars in the Hall of Musical Pillars resound like musical instruments. The Hampi ruins include the monolithic statues of Ugra Narasimha (Vishnu's incarnation of the man-lion creature), badly mutilated by the invading Moghul armies and Ganesa. The 22 ft. high statue of Narasimha had Lakshmi seated on his thigh - unfortunately it was hacked to pieces. The Virupaksha temple has beautiful gopurams, and on the way there is the King's Balance on which he was weighed against gold and diamonds which were then distributed to the people. A massive platform known as ``Mahanavami dibba'' has a floor area of 5,300 sq. ft. rising by a series of sculpted terraces. On this the king and queen would sit to watch the festivities below. Seated with them were other aristocratic women, who, according to Domingo Paes, a visitor from Portugal, ``wore collars of gold and bracelets so heavy that they had to be supported on either side''. The platform has densely carved bands of horses, soldiers, a couple of foreign looking dignitaries, and a scene showing girls sprinkling water during Holi. From here a bird's eye view of the ruins is impressive, and one can only wonder at how spectacular it must have been for Paes 400 years ago when he climbed up to gape and wonder at the opulence and the grandeur of the festivities. The Zenana enclosure is an eclectic blend of Hindu and Islamic styles, for the Vijayanagara kings had Muslim horsemen in their cavalry and traded in horses with Arabia, Persia and Portugal. The elephant stables are a majestic row of 11 domed stalls, with arched connecting doorways. There are lofty watchtowers, the queen's bathing enclosure and plinths of erstwhile palaces, and the Lotus Mahal, an ethereal structure which in the moonlight gives the impression of a floating palace. Here the cusped arches open to the playful breeze and the women whiled away their time here. Who was the man who created a legend with his capital Hampi, and made the nine day festival, Mahanavami, a wonder? The most brilliant of the kings, Krishnadeva Raya, has been described by Domingo Paes as of medium height and fair, a man who was an athlete, who could appreciate horsemanship. He was a good commander who ensured the stability and prosperity of his kingdom, and sensitive enough to encourage the arts in this atmosphere. 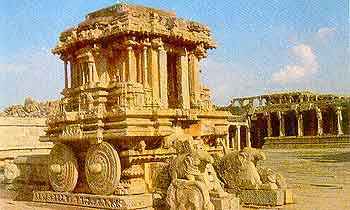 The ruins of Hampi can make your imagination run riot. In these surroundings there was a cultural efflorescence, when musicians, artists, and artisans gathered to create poetry and fulfill the grand vision of their kings. What is left of the Hampi ruins is evocative of what it must have been, the pomp and glory which brought visitors from across the seas to marvel and write about it.